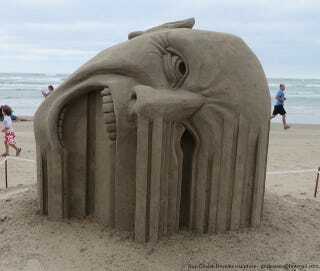 Behold "Bleeding," an absolutely incredible sand sculpture by Quebec City-based artist Guy-Olivier Deveau. It's so freakishly good it makes us not want to pick up a shovel and pail ever again. Deveau's piece finished third at the recently concluded Sandcastle Days 2013 in South Padre Island, Texas. Which makes me wonder what the two other winning entries must have looked like! These images come via My Modern Met who interviewed Deveau about the sand sculpture. Related: Did a massive dragon just wash ashore along England's Jurassic coast? | A mysterious, giant hand rises from the Chilean desert. Did a massive dragon just wash ashore along England&apos;s Jurassic coast?